"It started again after a month. For a week, my son would not get off the bed. He was that weak and tired from fever. The doctor kept prescribing medicines. When it happened over 4 times, our doctor said it was best to get him admitted. I never thought he would be diagnosed with brain cancer." Medulloblastoma is a cancerous tumor that starts in the region of the brain at the base of the skull. These tumors tend to spread to other parts of the brain and to the spinal cord if not treated at an early stage. Samarth has been advised to undergo chemotherapy in order to treat his condition. The total cost of the chemo is around 8 lakh Rs. 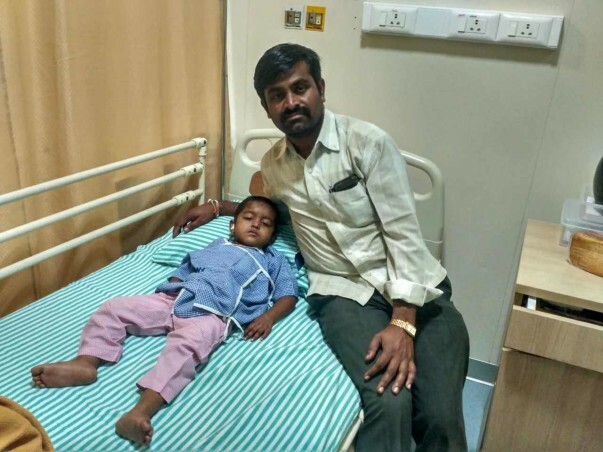 Raghavendra only earns 8000 Rs a month and is unable to afford the cost of treatment. He is scared that without the funds he would be unable to save his son from cancer. "This treatment will cost more than Rs. 8 Lakhs. I have spent Rs. 5 Lakhs already by borrowing heavily and exhausting my savings. 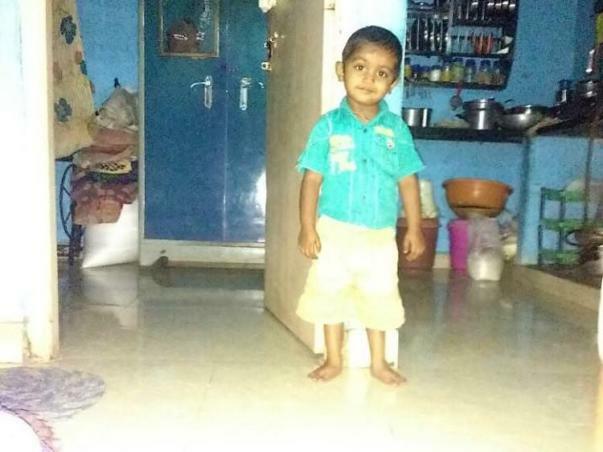 Now I am afraid I will have to stop treatment for my son because I will run out of money." He needs our help. 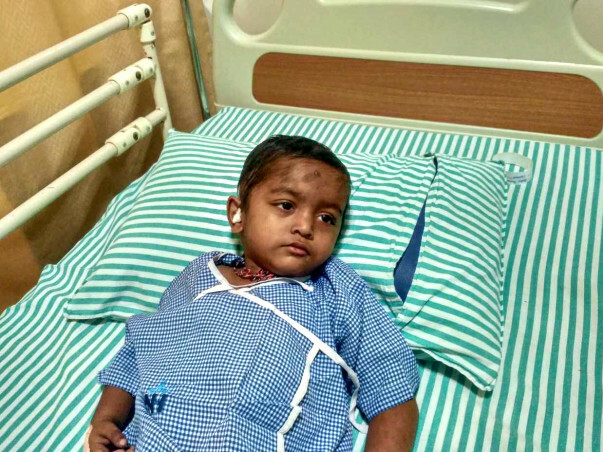 Your contribution can save Samarth and give him the treatment he deserves. 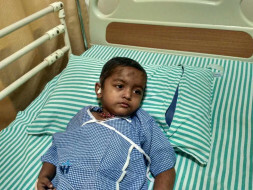 Samarth was discharged a few months back and will be coming for follow up once in six months. He is doing well now. He came for a follow up and the doctors suggested that he might be requiring another surgery but they will decide on the future course of action once he comes for the next follow up visit. Here's a quick update on Samarth's health. He has completed the treatment. He is on follow-up, there was an MRI done which showed results. We shall keep you all posted. 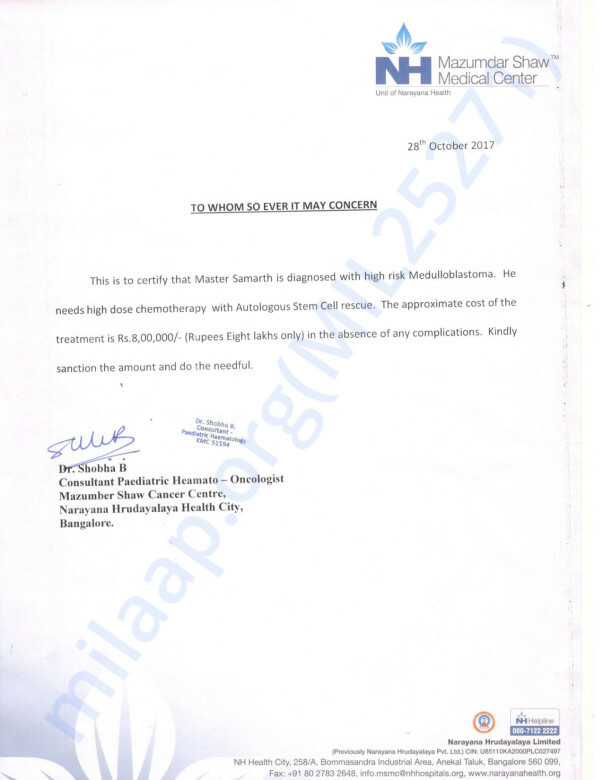 Samarth underwent his MRI scan and results showed a recurrence of the disease. According to the Doctors he now needs surgery followed by salvage chemotherapy. We will keep you posted in his condition.